U.N. Security Council To Try Again For Syria Cease-Fire Resolution : The Two-Way A draft resolution calling for a 30-day humanitarian cease-fire for emergency aid deliveries and medical evacuations has so far been stalled by threat of a Russian veto. 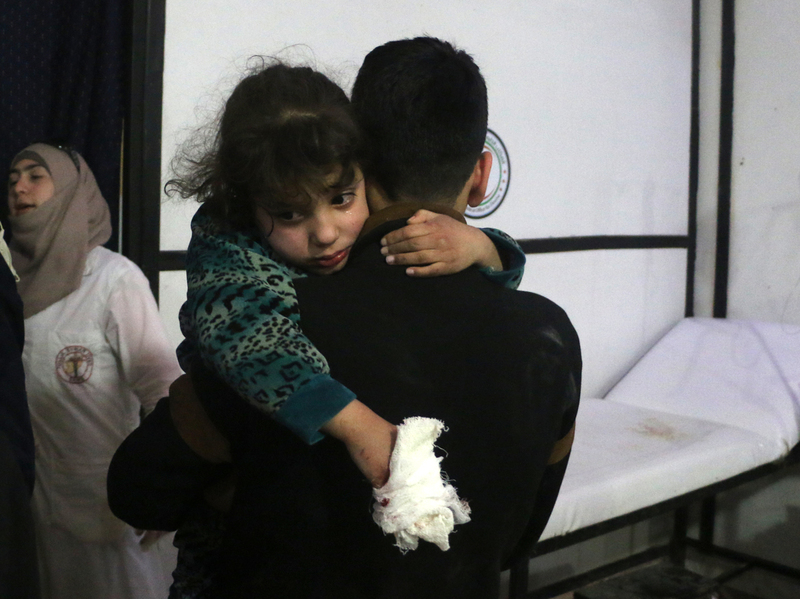 A lightly wounded Syrian girl is carried by a man at a makeshift clinic following Syrian government bombardments in Douma, in the besieged Eastern Ghouta region on the outskirts of the capital Damascus on Thursday. The United Nations Security Council is delaying until Saturday a vote to approve a resolution calling for a 30-day ceasefire in Syria. The move came after diplomats had scheduled a vote for midday Friday but were unable to come to an agreement on a draft resolution on when the fighting should stop. As NPR's Michelle Kelemen reports, Kuwait's U.N. Ambassador and the current council president, Mansour Al-Otaiba, said "we are close ... but until now there's no consensus." Kelemen added that after a day of delays and negotiations, Sweden's U.N. Ambassador, Olof Skoog, said council members been working "really really hard" on a Security Council resolution, but "have not been able to close the gap completely." He said, "I'm extremely frustrated" but added, "we all agree there needs to be a ceasefire" and discussions continue on how to define its terms. "I hope that we will adopt something forceful, meaningful, impactful tomorrow," Skoog added. U.S. Ambassador to the U.N. Nikki Haley made her feelings clear in a tweet Friday evening. "Unbelievable that Russia is stalling a vote on a ceasefire allowing humanitarian access in Syria. How many more people will die before the The Security Council agrees to take up this vote? Let's do this tonight. The Syrian people can't wait." The cease-fire is meant to allow emergency aid to be delivered and medical evacuations to take place in some of the country's hardest-hit regions, such as Ghouta, the rebel-controlled eastern suburb of the capital, Damascus, which has been pounded by government warplanes for more than a week. An attempt on Thursday to get such a resolution through the council failed when Syrian government ally Russia, refused to go along. It was not clear whether amendments put forward since then would mollify Moscow's objections. As Reuters reports: "Russia on Thursday proposed amendments to the resolution drafted by Sweden and Kuwait, arguing that the language was unrealistic and that the 15-member Security Council could not simply impose a truce on Syria without consulting the parties." Russia's U.N. ambassador Vassily Nebenzia said on Thursday that the proposed resolution was "simply unrealistic." NPR's Linda Fasulo reports that most Security Council members want the truce to go into effect within 72 hours, but Russia favors language that calls on all sides to halt hostilities "as soon as possible." To succeed, a resolution would need to garner nine votes on the council and no vetoes from the five permanent members – the United States, Britain, France, Russia and China. The death toll in the six-day bombardment of Ghouta is estimated to be more than 400. The Associated Press notes that "The number of casualties has overwhelmed rescuers and doctors at hospitals, many of which have also been bombed." The British-based Syrian Observatory for Human Rights said at least five people were killed in raids on Hammouriyeh, Zamalka, Douma and al-Marj, according to Reuters. In a just released report from Amnesty International, the group accuses Russia of having used its Security Council veto nine times "to shield the Syrian government from the consequences of war crimes and crimes against humanity." "Russia's routine use of its veto had become the equivalent of acquiescence in war crimes, allowing all parties in Syria's conflict to act with impunity, with civilians paying the ultimate price," Amnesty says.